A parasite that is longer than its host. Today's creature is a whole Phylum, the Nematomorpha. Berfore you freak out let me assure you that they only infest the bodies of arthropods, so you are safe. 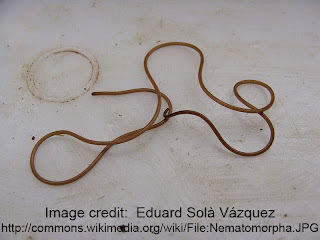 Nematomorpha are found in damp areas all over the world. The Nematomorpha are the closest raltive of the Nematode worms.